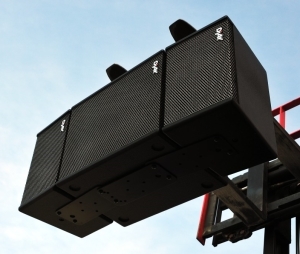 There is no doubt that the professional sound system industry is revolutionizing. Nowadays, it wouldn’t be uncommon to stumble upon a large-scaled performance with a crowd of over 100,000 audience members. Because of this, it would be challenging to use the old-traditional sound system to satisfy these immense crowds. In order to solve this issue we introduce the vertical-linear array. By positioning our speakers in a vertical stacking arrangement, we use the same amount of speakers and through the linear array theorem we are also able to cover a larger area of upward to several of hundreds of meters. However, we have also created a new problem: despite the fact that the vertical-linear array increased the sound travel area it also tarnished the sound balance. To increase the sound travel range we had to increase the power of the high frequency unit by increasing both the diameter of the sound coil and the horn. But as a result, the effective channel of the high frequency unit decreases. The frequency would be as high as 16kHz; whereas, a typical speaker could not even produce 10kHz. Due to the increased power, when 2 or more boxes are placed together vertically the frequencies would interfere with each other, which would decrease the sound quality. In order to solve this problem, our engineers have designed various shapes of sound balancing boards that would aid the frequency interference issue. This dilemma is a common mistake made by many people who have overlooked the root of the problem. This just goes to show that we take it upon ourselves to solve every problem that arises. However, even though we have solved frequency issue we still have to deal with not only the alto but especially the bass. By using several 18” sound boxes we have effectively increased both the sound and bass distance. But in return we have also distorted the bass quality. This is because the frequencies of the double 18” differ from the frequencies of both the alto and bass. This will cause the imbalance of the alto and bass when heard from a far distance. Think about it like this. The frequency of a piano is about between 10Hz-5 kHz, a range that can be easily heard by the human ear. But has anyone wonder whether or not the low, mid, and high frequencies come from the same piano or another source? The linear array products that people use nowadays will experience these problems: the sound is too loud at close distance and unclear when heard from far distance. Please note we are talking about the volume and not the sound quality. 1. How do we increase the sound range of a speaker without disrupting its frequency? 2. How do we create a subwoofer with the same diameter to cover all frequencies? DjAV of the United States of America has found the solutions to these problems and has invented the first 8” linear array prototype. All of the prototype units are 8” including the subwoofers. The second unique feature of the prototype is that subwoofer uses 8” sound unit, the treble uses 25mm core sound coils with 15 watt rated power. With 2 pieces of 312 bass and 4 pieces of 808 all channels along with DjAV Exchange Peripheral equipment and amplifier we are able to hear 110db sound pressure in a 60 x 60 meter area. At the displacement distance of 60 meters it is 99db. But what is important is that the sound is not distorted at all! In other words, as long as you can hear the sound you are guaranteed to hear the low, mid, and high frequencies at the fullest. The revolution of the sound system industry begins now. All Product Made in USA. Web servers in USA.